It’s no wonder Friday with its perfect weather conjured up the blues. The wonder is that I didn’t connect the dots earlier. It’s been a beautiful weekend. Friday was especially delightful. It was sunny and a little cool but nice, very nice. Still, for some reason I couldn’t shake a mild case of the doldrums. I even ate lunch with a good friend, the kind you can jump from topic to topic with, and neither of you get confused or lost. Still, the feeling lingered. My sister and her husband Allen came over to bring a table, and when I saw her walking away, there it was again, that twinge of something. I visited the Red Door Thrift Boutique and then headed to the eye doctor’s office for some contacts. When I walked out into the sunshine and felt the moderate temperature and the gentle breeze, I thought of how weird and wonderful it was to be experiencing this kind of weather in February. Driving out of the parking lot, I had a quick impression of my parents and of how they had lived in Camden all of their adult lives. They had both visited this very office and driven the city streets day after day, year after year. Had they too enjoyed looking at the parks on either side of Laurens Street as they left Dr. Moore’s office? Then it hit me, the reason for my melancholy. 15 years ago on an identical February day I made the trip from Conway to Camden to see my mother who was coming home from a four-day stay in the hospital that day. She’d been receiving her first round of chemotherapy for the cancer that would take her life nearly five years later. I recall feeling nervous, anxious about how I’d find her. Would she be too weak to walk? Would she still have her beautiful silver hair? I arrived at the same time her sisters drove up with Mama in the car. She seemed fine, just tired. As I recall, I took her bags in, and her sisters left. There we were, the original family, just Jayne and her parents. The difference was that this time they were both in need of care from me and not vice versa. It was weird, and I was jumpy. I took lunch orders, thinking it’d be nice to have burgers and fries and ice cream, but Mama opted for saltines. Daddy agreed to a kid’s burger from Mickey Dee’s. Sitting at the kitchen table where we’d gathered literally hundreds of times, I felt awkward and on the verge of tears. My father managed to eat half of his burger, and my mother forced down a couple of saltines. Then she went to bed, and he went to the den to read. I tidied up and then went outside to clear my head and get a breath of fresh air. The house seemed stifling. It wasn’t. My frame of mind just made it seem that way. Some visitors came by later, and I went for a walk with one of them. As we walked, both of us remarked on the gorgeous weather. As we sauntered up the block with my parents’ little Dachshund skipping along in front of us, it was almost (but not quite) possible to forget my parents’ state of health. Despite the sun dappled sidewalks, the upbeat conversation, and the antics of Eva, the dog, my heart was heavy. I didn’t know what was ahead at that time, but I knew it wasn’t going to be easy. I sensed that it was the beginning of the end, the end of their lives and the end of my life as someone’s child. The juxtapostion between my frame of mind and the gorgeous February afternoon was a stark contrast. I’m wondering if making a conscientious effort to look for the good stuff has made a difference in my attitude of gratitude. Yesterday was a stupendous day. Actually, I’ve had a lot of those days lately, but yesterday was exceptional. Maybe I’m just a tad more observant because we are, after all, about to enter the month of Thanksgiving. Then too there’s the fact that I love love love this time of the year. My parents got married in November, and since I was born nine months later, I like to think of it as the month I actually began my life. Oh, and two of my children were born in November too. Waking up at least semi-rested. While I like to get at least seven hours of sleep, I can rock and roll on six. Working all day on the Kershaw campus without having to drive to another location. Eating lunch with some friends. While we were munching on our chips and salsa and discussing family idiosyncrasies, a couple we knew from church came in, and we chatted with them for a moment or two. When we went to the front to pay our bill, we discovered that the mutual church friends had taken care of it for us! Isn’t that amazing? Not to mention generous. Did I mention that while we were eating we got to look at the life-giving rain falling gently outside? After lunch, I worked on online courses some more and chatted with Lisa and Lach, some colleagues whose conversation I always enjoy. After work, I delivered some mums and visited briefly with the flower loving ladies. When I left my mother-in-law’s house, it was with a big container of homemade vegetable soup for dinner. I walked 50 minutes and enjoyed the changing autumn landscape of the neighborhood. I even picked up a few hickory nuts and acorns with thoughts of using them in some fall craft or table decoration. Speaking of autumn, I read and reread a beautiful Robert Frost poem (October) that Martha posted on FB. I dined with my hubby, an enjoyable activity until he began reading the newspaper. I checked Face Book and relooked at some pictures of Carrie, Amanda, and sweet baby Olivia. 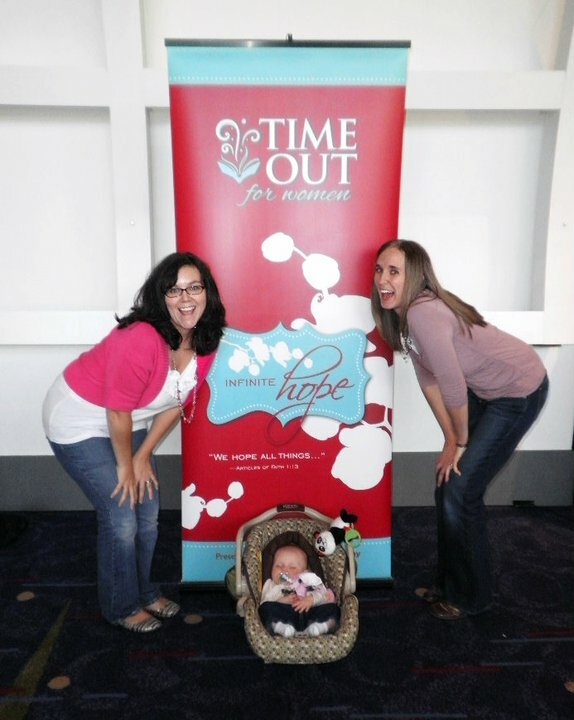 It makes me happy to think about the three of them spending some time together Saturday at Time Out for Women in Atlanta, especially when I consider the uplifting and inspirational messages they received. Only one negative event occurred. Someone forgot to turn off the burner under the soup pot, and as I was doing my Susie Homemaker thing in the kitchen, I put a plastic container right on top of the burner. Later, I kept smelling something pretty awful, and when I walked into the kitchen, flames were engulfing the plastic container and its contents. Now we have a permanently damaged stove top and only three useable burners. I’m wondering if it’s time for a new stove. This one’s about 20 years old and doesn’t go with the updated kitchen. At bedtime, I still had a slight edge in FB Scrabble. Today’s been great too. So was the weekend. I’m wondering if making a conscientious effort to look for the good stuff has made a difference in my attitude of gratitude. For the last several nights, I’ve braved the frigid temperatures to go outside and cover my Sago palms with cloth. In years past, I’ve been a little slack about protecting them from the cold and frost, and their green spiky fronds have turned brown and sad looking. A kind friend once told me that she thought they looked gold and hence added a unique and upscale look to the landscape. Yeah, right. I’m probably stretching things a bit here, and yet I can’t help comparing the pansies to some people I know. While they may appear frail, they’re really tough, resilient, and hardy. They’re like steel magnolias. At the same time, the Sago palms look robust and tough, but they’re really not…at least not in cold weather. A cold snap and their fronds are dead and brown. In years past, we’ve cut the dead fronds and are always thrilled to see the new green life emerging at the base of the plant. I guess there’s a lesson there too (pruning and growing), but today I’m thinking about those pansies and their lesson. If something as lovely and delicate as they are can withstand winter’s worst, so can I.
There’s no way I can let this splendid month of October pass without a tribute to my parents. John and Margie both left this life for the next in October, he in 1998 and she in 2000. Never before did I realize just how gorgeous this month is until I saw its beauty juxtaposed to the sorrow and shadow inside the hospital/house where they spend their last days. Frankly, his death caught me by surprise. True, he had been sick with chronic respiratory disease for years and had recently been hospitalized. I wasn’t overly concerned about this, however, because I had two siblings who lived close by, and my sweet mama was still alive and well. Although she had battled cancer for three years, at that point in time, all was well. Back to t he story. Around 5:00 a.m. on the morning of October 18, my brother called from the hospital to tell me that the end was near. My daughter Carrie and I quickly dressed, and after giving a few words of instruction to my son, she and I jumped in the car and headed out. About an hour into the trip, I called my sister and learned that he had just died. I’ll never forget those moments at Jimmy Carter’s on Hwy 501 between Conway and Florence, SC. We were pumping gas like nothing unusual was going on and yet a pillar of my life had just been knocked from beneath me. All around us, people were chatting, and cars were whizzing by as if nothing had changed. When Carrie and I finally got “home,” the sun was up, and that Sunday was a bright, light filled day. Friends came and went, my brother from Virginia arrived, and it hardly seemed real that our father was not there to partake in this togetherness. Perhaps he was there after all; I’d like to think so. Fast forward two years, and again it’s October. This time, it’s my mother who’s ailing; failing would be the better word because each passing day found her weaker and weaker. In and out, my siblings, our children, her sisters, and her many friends began what I can only call a death watch during that last week. Hospice workers came each day to check vitals, give instructions, change bandages, offer encouragement, and so forth. More than once, we gathered at the table in the kitchen and dined on scrumptious food prepared by my mother’s loving friends. Although there was deep sadness, there was laughter too…and memories of a life well-lived. I know for a fact (she told me) that although she was unable to move or join us, she enjoyed listening to the sounds of life bouncing off the walls throughout the rooms of 511. When I felt overwhelmed (which was almost always), I’d go for a walk, and I can still remember walking out on the front porch and being a little shocked at the beauty of the streetscape. Leaves were changing color and falling, the temperatures were brisk, and the sun seemed especially bright. How could there be so much beauty outside and so much sadness inside? On that Friday afternoon, Carrie suggested that we get out for a few moments, and I agreed. After all, my three siblings and my mother’s sisters were “holding down the fort.” It was a beautiful day, and I enjoyed spending time with Carrie who had come from Connecticut to spend some time with her granny. Around 4:15, I told Carrie that I felt uneasy and expressed the need to get back to 511 Chesnut. In tune with the spirit, she readily agreed. I remember taking a deep breath before leaving the light filled outside to step into the dark, cool hallway. 45 minutes later, with her family and little dog (she loved little Eva), around her, Mama left us. I hope she felt our love. Years later, these two people are still in our hearts and minds. Their legacy lives on. If I ever doubt it, all I have to do is look at the faces of their progeny to glimpse a certain something of John and Margie. My calves are feeling a tad sore today, a reminder of the miles DH and I walked in the mountains of NC this past weekend. I’m not complaining, however, for the slight tightness reminds me of our time together as we enjoyed the splendors of Mother Nature. We said, “Look at that!” so many times when one of us spotted yet another breathtaking view that it became almost humorous. Another reason I’m not complaining is because I’ve come to realize that it’s wonderful to have legs that work so well…and a heart and lungs that still do their jobs. DH and I half-seriously commented that one of these days we might not be so blessed to be able to traverse such terrain. · and so on and on. Our little weekend getaway reminded us that there’s a gentler way of life up the road adn that the world is full of beautiful sights we’ve yet to experience. On Fridays, I have the good fortune to be able to work from home, and this morning, I’m going to intersperse my online course work with my blogging…beginning with blogging. One must establish priorities, right? There are lots of thoughts and experiences running around in my mind, but I think I’ll begin with something that happened last Saturday. My sweet, sassy little granddaughter Brooke had her third birthday party last Saturday, and my daughter Elizabeth and I were determined to be a part of the celebration. Brooke’s parents had planned a carnival complete with games, prizes, popcorn, hot dogs, and pink smiley face cakes. Brooke’s mom Carrie is incredibly creative so I knew we were in for a treat. By the way, I may be a little biased when describing Carrie as so creative, but I think her friends would agree. And I think the reason I’m so awed by it is because I don’t have a creative bone in my body. Early that morning, Elizabeth and I headed out for GA in the pouring rain. As we continued our three-hour trek, I kept thinking that surely the rain would cease, but it didn’t. I should add that it was wet AND cold that day. We arrived at our destination around 11:30 and literally ran into the house where the games had been moved in from the back yard which had turned into a soggy mess. While watching the children compete in a “candy walk,” I got a call from DH warning me that more freezing rain was expected in SC and that I needed to get home ASAP. Plus, he warned, for Elizabeth to drive back to the coast that night would be utter folly because of the danger of black ice. Not all that concerned, we hung around until mid-afternoon and then again braved the wet, nasty weather and slick roads. At times the rain was so heavy that the windshield wipers were doing double-time, and I still couldn’t see that well. Hours later, we arrived home, and it was STILL raining. Fortunately, I was able to convince Elizabeth to spend the night. Here’s how the motto came into being. We once went through a season in which family members put an inspirational quote of the week on the refrigerator door and one week my son’s quote was “No matter how dark the night, morning always comes.” Impressed by the depth of his thinking, I asked for the source and was surprised and a little caught off guard when he told me it was a video game. A video game. Truth surfaces in the strangest and most unexpected of places. Still, it’s true. Morning always comes. Storms always pass. Regardless of the raging storms or dark nights we have, the sun rises. Here’s a great scripture (Psalm 30:5) that’s perfect for these thoughts: “Weeping may endure for a night, but joy cometh in the morning.” I don’t know about you, but there have been plenty of times when I needed that reminder.